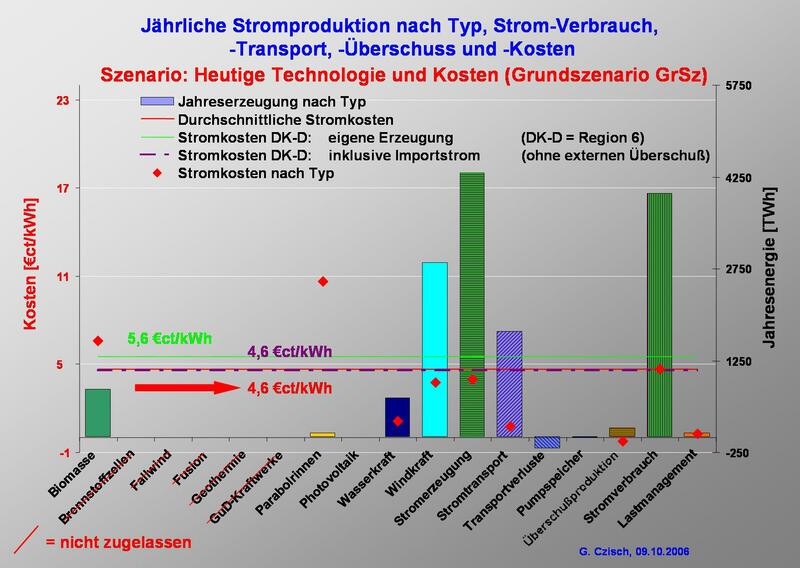 The promising results for the base-case scenario – which assumes an electricity supply system implemented entirely with current technology using only renewable energies at today’s costs for all components for detailed information on underlying assumptions) – indicate that electricity could be produced and transported to the local grids at costs below 4.7 €ct/kWh, which hardly differs from the case of conventional generation today. (At gas prices in 2002 of about 2.4 €ct/kWh for industrial consumers in Germany [EC 04], electricity from newly erected combined-cycle gas power stations had already reached significantly higher 5 - 6 €ct/kWhel. Also the prices for cheap base load electricity e.g. at the EEX are higher than the costs of electricity in the base-case scenario and already reached more than 6 €ct/kWh.) In this scenario, nearly 70% of the power originates from wind energy produced from wind turbines with a rated power of 1040 GW. 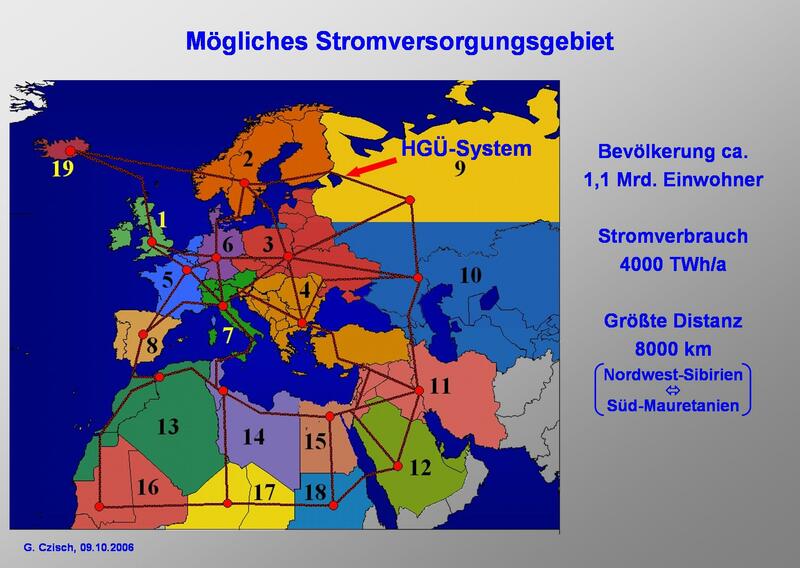 Biomass and existing hydroelectric power plants provide most of the backup requirements within the supply area, in which the individual regions are strongly interconnected via HVDC transmission lines. Electricity is generated from biomass at 6.6 €ct/kWhel after proceeds from heat sales have been factored in. This result lies significantly above the average price level, yet the backup capability is essential to reduce the overall cost of the entire system. About 42% of the electricity produced is interregionally transmitted via the HVDC-System whereby the total transmission losses sum up to 4.2% of the electricity produced. Another 3.6% loss is production which neither can be consumed at the time it is produced nor be stored for later use within the pumped storage plants and therefore is produced in excess. These two losses may be considered quite acceptable for an electricity supply only using renewable energies. Diese Seite wurde zuletzt am 3. Oktober 2010 um 13:31 Uhr bearbeitet.